A variety of 3-sided analyzer shelters are made of stainless steel (SS304 and SS316 grade plate) or HDG steel (painted to specific specifications). 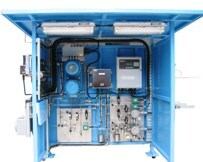 The analyzer shelters with specific requirements are also available. The dimensions of analyzer shelters vary from 1.0W x 0.8D x 2.0H (m) up to 10.0W x 2.0D x 3.0H (m) subject to the quantities of the pre-installed process analyzers.